Exclusive Video: Nicola Formichetti x MAC Cosmetics for Building Fashion's Pop Up Shop! Anyone who is is a fan of Nicola Formichetti, the zeitgeist of fashion now, will be thrilled to know he has opened a pop up shop. Finally! Anyone who is is a fan of Nicola Formichetti, Lady Gaga, the zeitgeist of fashion now, will be thrilled to know he has opened a pop up shop. The buzzed about non-profit, BOFFO has recently launched the 2nd annual BOFFO Building Fashion event with the two week opening of Nicola Formichetti + Gage/Clemenceau Architects concept shop. Under Formichetti's direction, the 1,300 square foot space at Karkula's (50 Walker Street), has been transformed into a mirrored prism. Imagine walking inside a disco ball and you get the picture. The store will house a collection of limited edition pieces available to purchase such as Thierry Mugler menswear and womenswear, Nicola's iPhone cases, jewelry, candles, t-shirts and exclusive designs by emerging international designers. 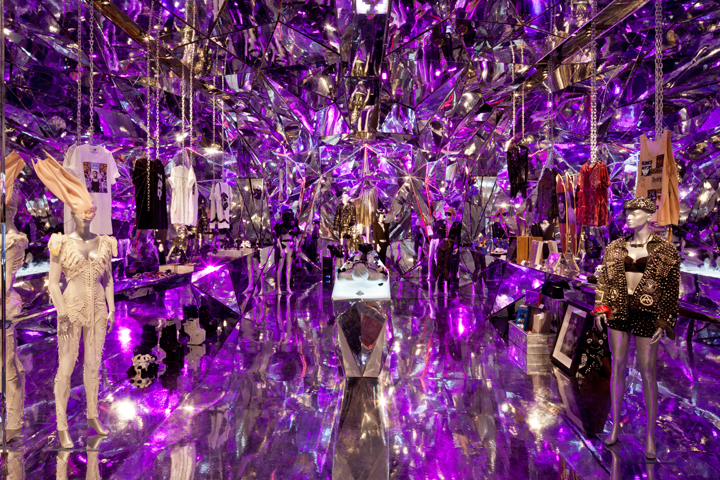 Nicola's will also feature installations from Formichetti's past and present creations and collaborations. As the Creative Director of Thierry Mugler, Fashion Director to Lady Gaga, the Haus of Gaga, Uniqlo and Vogue Japan, as well as contributor to V Magazine, Dazed & Confused and Another Magazine (someone's a busy bee), Formichetti has created some of the most memorable imagery, performances, and moments in recent pop culture history and you too can check it out! If that isn't enough, to continue their support of Nicola, Mac created this video which can only be seen here and at the store. They left Nicola up to his own devices and he created a self portrait of himself in his most primal state (naked) being brought alive by the vibrant colors and textures of Mac. Photos courtesy of Evan Joseph.